Carol Ann Duffy and her merry band of poets embark on their tour of the UK this weekend. Here's what they'll be listening to on the road. 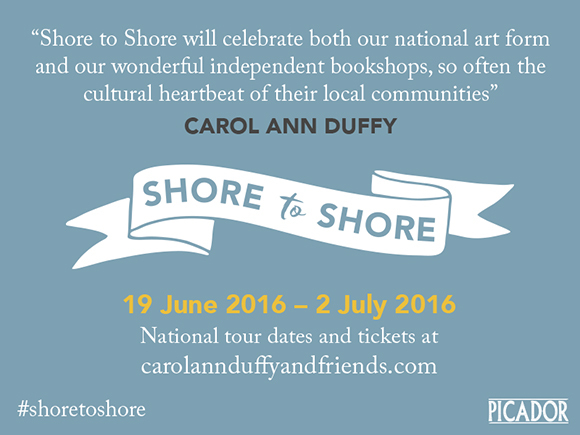 Carol Ann Duffy and her merry band of poets embark on their Shore To Shore tour of the UK this weekend. Here's what they'll be listening to along the way. Over fourteen consecutive days across Britain from Cornwall to Scotland, the Poet Laureate will perform alongside three of the fellow poets whom she most admires: Gillian Clarke, Imtiaz Dharker and, the new Makar, National Poet for Scotland, Jackie Kay. Each evening will be accompanied by music from instrumentalist and composer John Sampson plus a special guest poet. Each of the performers on the tour has contributed to this roadtrip playlist which will be the soundtrack to their travelling celebration of poetry and community. No Shore To Shore playlist would be complete without music from instrumentalist and composer John Sampson, who is accompanying the poets on the tour. The Shore To Shore tour begins in Falmouth on Sunday 19th June and finishes in St Andrews on Saturday 2nd July. >>>Full tour dates and tickets are available here.